Talking about Masterchef and interesting food cultures, I always remember this episode of Australian Masterchef showing Amina (a contestant) cooking gozelemes for Hobart market challenge. Watching how the judges enjoying her gozelemes makes me feel like I wanna try some too. Ironically, we have not tasted any Turkish made gozleme before! All freshly cooked gozelemes seems to be "hot property" at all time and there is always long queues waiting to buy and taste these delicious-smelling pastries. We never have the time and patience to be part of these extremely long queues and that's why we never get to taste any Turkish made gozelemes even until today. "Why not I cook gozleme for you?" My husband gave me an instant skeptical eye when I said this to him... I have never cook gozelemes before and don't have friends that can give me any cooking advices. I guess the best way for me to cook this is to test and try several recipes that I can find from my food magazines and internet. Of all the recipes that I have found, I had tried two kinds of gozeleme pastry recipes, one contains yeast as its raising agent (from Taste.com) and the other one is the instant kind which uses self raising flour (from Australian GoodFood magazine, June 2012). The yeasted pastry is a wet and sticky dough which is quite difficult to knead and handle but the cooked pastry turned out to thin, crispy and amazing good! In contrast, the self-raising pastry is easy to prepare but difficult to roll out into thin layers and eventually turned out to be a doughy flop. Using this gozeleme recipe, I have cooked my gozelemes with two kinds of fillings, the chicken or the beef versions. My husband and son were happy eating all gozelemes when they were freshly cooked from my kitchen and they like both the chicken and beef versions. After the meal had finished, I was laughing at my husband because he was still feeling skeptical with me cooking nice gozelemes. Nevertheless, I must admit that the credit should go to this gozeleme recipe because this is really a good one. Meanwhile, heat 2 tbsp oil in a frying pan over medium-high heat. Add eggplant. Cook, stirring, for 6 to 7 min or until eggplant is tender. Drain on paper towel. Add onion and garlic to pan. Cook, stirring, for 3 min or until onion has softened (I removed half of the onion mixture). Add mince (chicken). Cook, stirring, for 6 to 8 min or until browned. 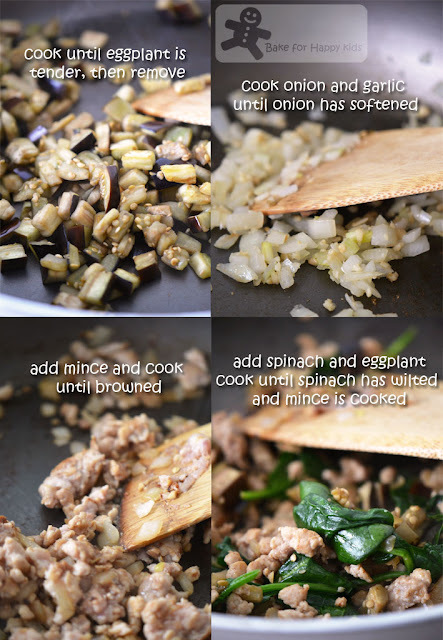 Add (half amount of) spinach, chilli (I add this later) and (half amount of) reserved eggplant. 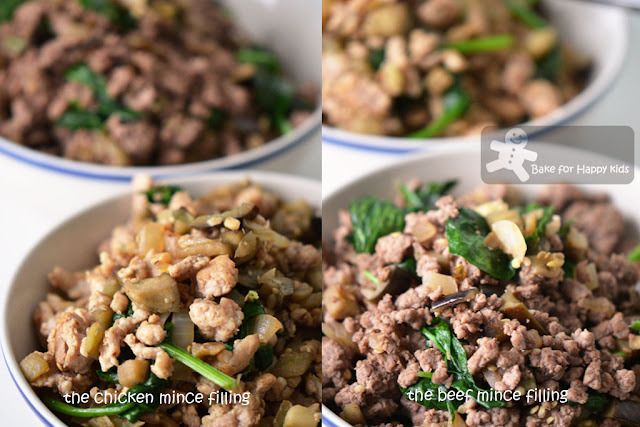 Cook, stirring, for 2 min or until spinach has wilted and mince is cooked. Remove from heat. Stir through (half amount of) feta and lemon juice. Repeat the same step to cook the beef filling. Divide dough into 4 equal portions. Roll 1 piece into a 32cm x 20cm rectangle. Place a quarter of the eggplant mixture over one half of rectangle. (I sprinkled some chili flakes onto the adult-consuming gozeleme at this stage) Brush opposite edge with water. 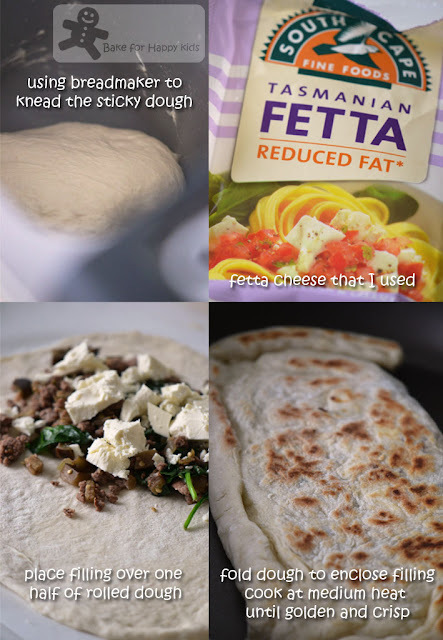 Fold dough over to enclose filling. Press edges together to seal. Repeat with remaining dough and eggplant. Heat a frying pan over medium heat. Brush one side of each gozleme with 1-2 tbsp of olive oil. Cook for 3 min or until base is golden. Brush uncooked side using remaining oil. Turn over. Cook for 3 min or until golden and crisp. Transfer to a board. Cut each gozleme into 8 slices. Serve. The gozeleme dough recipe that uses self raising flour has not worked well for me but it had worked very well for Guru Uru from Go Bake Yourself and so the recipe adapted from Australian GoodFood June 2012 is not provided in this post. Anything with with feta, eggplant I am in. Delicious. Love to explore various cuisine from the comfort of my kitchen. Looks wonderful, Zoe! I have never used eggplants for stuffing in breads or pastries, sounds delicious! And gozlemes? totally new to me! I don't eat beef, but I don't mind having the chicken one, looks so yummy! Love the filling,it look so good. Thanx girl for the big shout out! You rock!! It was really amazing co-hosting the event with you guys! Thanx Zoe for the awesome experience :D.
Your gozleme looks yummy. Would love to have one right now as its breakfast time and m hungry! The gozlemes look so inviting especially with the generous amount of filling! 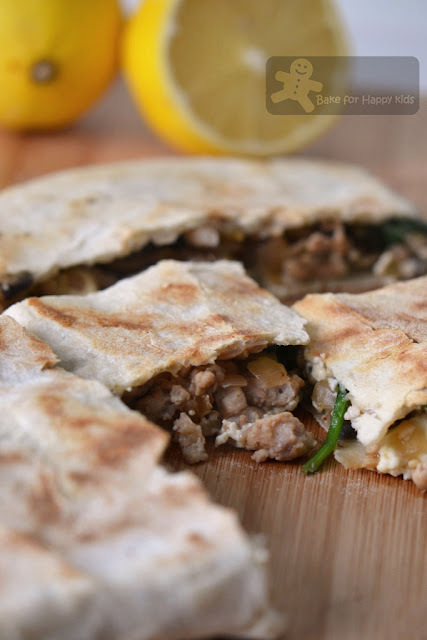 Hi Zoe, I have never come across Gozlemes before, it reminds me of pita bread. And my kids and hubby also loves this kind of bread with filling. Recipe looks simple, will note down for a quick Saturday lunch as it looks so delicious! Looks falvorful and so delcious! I've never heard it...it looks yummy! I agree with baby sumo, these loo like paratha or souvlaki, i love them!! Been craving for some turkish wraps kinda food for a while, and its hard to find good ones here in malaysia. Thanks Zoe, i must try to make this. These gozlemes are actually very different from roti paratha souvlaki. They may be a little similar to pita bread as the pastry of these gozlemes are not oily and chewy at all. I never have Gozlemes before. It looks good. Yum...those gozlemes look like a big pie made from roti canai. I mean, from the photo the dough looks like roti canai. I am sure it is extremely delicious! This looks really good! I know I would love it! I've never heard of gozlemes, but they look delicious! This looks very delicious, Zoe and my kind of yummy foods! Great pics and recipe is must try! Thanks for sharing and have a lovely week!!!! Great idea for lunch on a lazy Sunday afternoon... served with chilled white. Black banana ice cream sounds fascinating. HI, Zoe, you are the best mum & best wife! My children love gozlemes! If we go on food fair, we will definitely buy it to eat. The one that is most commonly selling at the food fair stall is spinach & fetta gozlemes & my children love it! I'll share my photos with you later in my future post. Thanks for trying 2 types of recipes & share with us the differences! I'll definitely go for the yeast version if I try in the future! i never heard of these but i like how the dough was prepared and cook over the pan, sounds like roti too!! 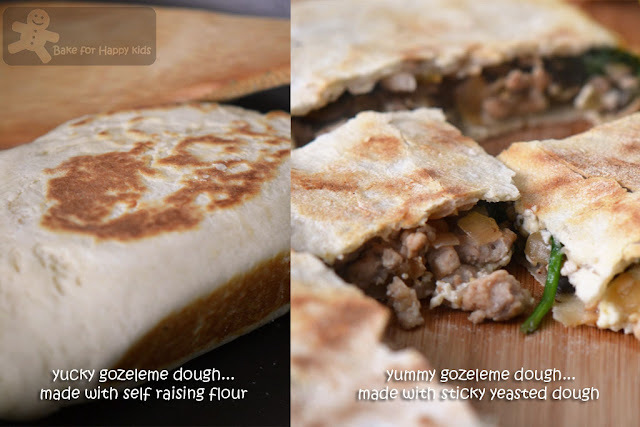 Sorry for my late response... Just want to clarify that this gozleme recipe that I made is very different from the Singaporean/Malaysian kind of roti canai or paratha. The pastry of these gozlemes are not oily at all. They are crispy on their outside and also thin and light for their overall texture. Unlike roti canai, paratha or murtabak, they are not rich, chewy and buttery at all. Nice to know that these "not-fatty" kind of pastry are actually very delicious! This gozlemes is new to me. But after looking and reading your post this sounds so healthy and good.